Sitting may not actually be “the new smoking,” as one headline claimed, but the consequences of our sedentary ways are definitely catching up with us. Fortunately, the remedy is straightforward: Develop better office fitness habits to sit less and move more. We all need to be less sedentary and more active at work. Whether you simply stand up a few times an hour or choose to work several hours a day at a treadmill desk, getting moving at work boosts your productivity and sets you on a path to a longer, healthier life. 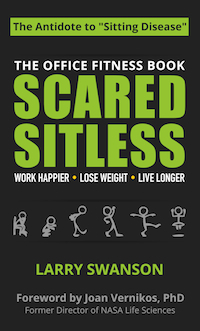 Scared Sitless is a fun title for a serious book. Deeply researched and backed by the latest scientific findings, this book gives you an accessible summary of the science behind “sitting disease” and an actionable plan to do something about it.